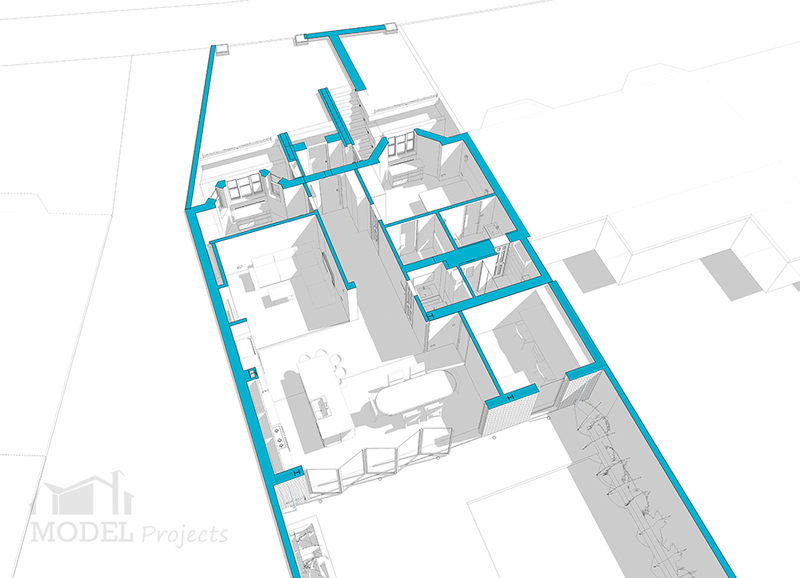 This project involved alterations to a two bedroom lower ground floor apartment in Kensington, London. The proposed design included the re-arrangement of the internal space. An extension to provide open plan living and an extra bedroom was added. The design included a new stone staircase to the entrance of the flat. Model Projects designed the addition of a guest room/nursery with a storage unit, located underneath the bay window. At the rear of the property a large open plan kitchen, dining, and living space looks out onto a walled courtyard garden. Large glazed bifold doors bring light into the space, enhancing the views of the garden. Model Projects worked with the clients to create a space that included their style, for example their antique dining room table fitted well within the new room. The living room seating arrangement was separated from the working kitchen and provided excellent views of the open plan area and garden. The new extension allowed space for a study. This was separated from the living area by the use of double doors. Model Projects enhanced the design of the master bedroom suite by the creation of a walk-in wardrobe and ensuite. The design of the kitchen forms the centerpiece of the open-plan living spaces. The kitchen is a painted, handcrafted, Shaker- style, with clean lines and handled units. The layout is a line and island with the sink located in the breakfast bar and the range cooker to the wall. 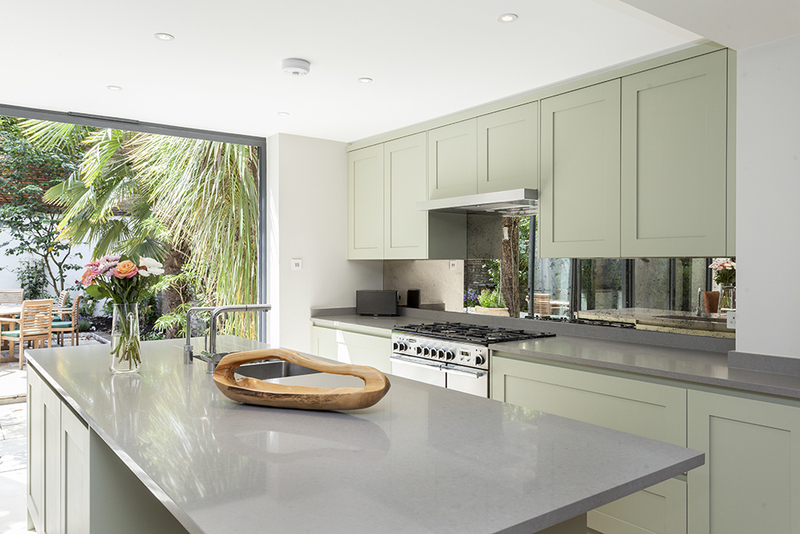 A vintage glass splashback adds a unique perspective to the space, along with the striking olive green units and simple grey worktop. 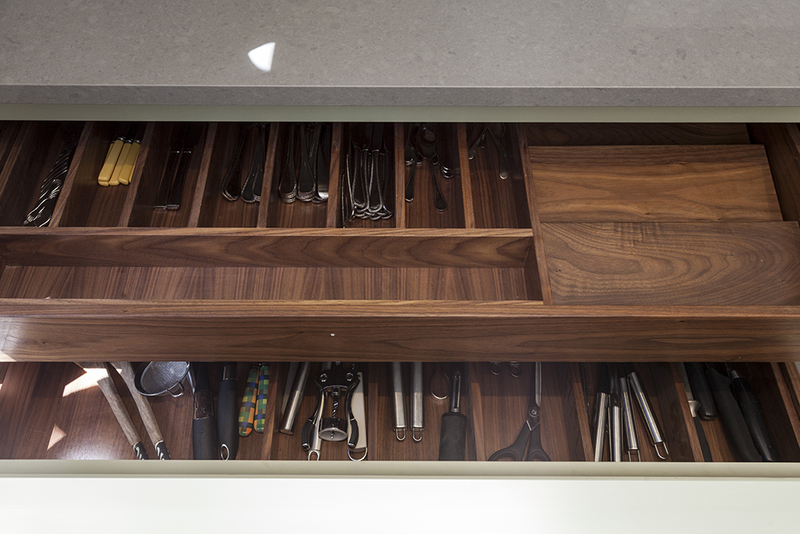 The olive green units are offset with rich dark wood drawers. The floor consists of large limestone tiles that help reflect natural light into the spaces. The clever use of lighting and smooth wall finishes have provided a sleek and fresh approach to this property. The design helps enhance the beautiful original features of this flat. It was a fantastic experience with Model Projects from start to finish. We began with reimagining the space from a two bedroom flat to a three bedroom, with the potential to extend into an upstairs flat in the future and create a maisonette. Kathryn was our project manager and ensured that we got a lot of support, ideas and assistance throughout. She took a lot of the pain out of the process and bought much needed fun and creativity. The builder tending process was made simple and we found a fantastic company in GJ Design, who were efficient and delivered to plan and almost on time (the delay was partly our fault with moving goal posts). Having lived in the space for almost a year now, I cannot recommend Model Projects or the process of having assistance on a building project more highly. I've referred them to all of my friends contemplating home renovations. As the property is a flat, planning had to be submitted via a full householder planning application and approval was subsequently given. The property was increased in size from 173m2 to 191m2, (enhancing the property by 18m2).